Given that market data provider Platts only started tracking spot prices at the end of 2008 when the commodity was trading just below $60, the market for the steelmaking raw material is fast approaching unchartered territory. While the surge in supply has received most of the blame for the tanking price in 2014, fresh worries about the demand outlook is behind the latest decline. And those fears centre on China which imports more than two-thirds of the global seaborne trade expected to hit 1.4 billion tonnes in 2015. China today forges nearly as much steel as the rest of the world combined thanks to its decades long urbanization push and construction boom. But that construction and property boom now looks in danger of imploding. One looming “black swan” is the Chinese housing markets, which is providing to be a key source of pressure on the economy (notwithstanding last year’s upward GDP revision which merely reflected a different accounting procedure) and creating financial strains along the way — all 70 mainland cities are now experiencing YoY home price declines of between 1 and 9%. Friday’s NYT cited reports of major apartment complexes now are only between one-third and one-half unoccupied, and that many projects are halfway through construction and the cranes are now idled. This is a crucial overhang for a sector that directly accounts for 13% of the economy and indirectly (via the impact on ancillary sectors) that number is closer to 33%. Even with the builders cutting their housing start production by 34% in November from year-earlier levels, demand has weakened to such an extent (because affordability has become extremely stretched to the point that in the big cities an apartment costs 20 years’ worth of wages for college grads), unsold inventory in the large cities ranges between 12 and 18 months of supply — that is huge and explain why average prices have fallen 7.4% since April alone. Before the move to spot pricing the price of 62% Fe never strayed from $10 – 14/tonne for more than 20 years thanks to annual pricing set during secret negotiations between the Big 3 producers and Japanese and Chinese steelmakers. 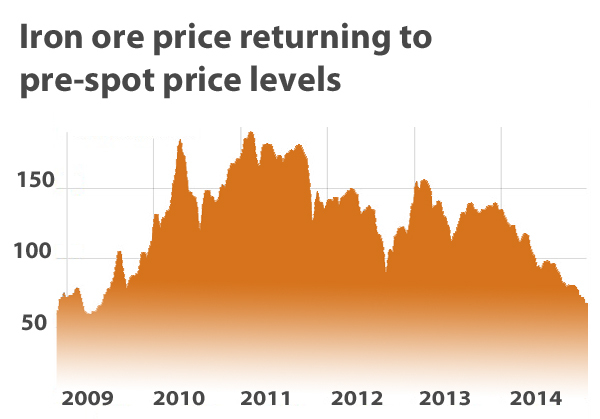 Once the spot market was unleashed not even the fallout from the global financial crisis could stop the rise of the iron ore price with Tianjin CFR 62% Fe 3.5% Al hitting $191.90 a tonne on February 16, 2011.